The door on the two sides can be pulled inward thereby preventing debris spraying all around the cage. Includes bonus eBook series ‘YOUR PERFECT PET GUIDE BY E-COMMERCE EXCELLENCE’. 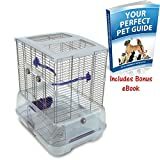 Small, single height bird cage for budgies, canaries, lovebirds and finches with extra deep tray, including accessories. The Hagen Vision Bird Cage for Small Birds (S01) is an innovative, practical, single height small bird cage that is easy to put together! The door on the two sides can be pulled inward thereby preventing debris spraying all around the cage. Hagen Vision’s unique no-drawer design simplifies cage cleaning: simply detach the cage portion and empty the contents of the base into the waste bin. The result is less time-consuming, messy clean-ups associated with bird keeping, leaving you more time to enjoy your pet. Vision’s deep base can handle multiple types of litter, while raised ridges inside the base provide air circulation and help prevent mildew. Additionally, the multi-grip surface of the perches boosts circulation and helps prevent problems with your pet bird’s feet. The Hagen Vision Bird Cage for Small Birds (S01) at a glance: Dimensions: 45.5 x 35.5 x 51 cm (L x W x H) Horizontal wire: 1.6 mm Vertical wire: 2.6 mm Wire spacing (center to center): 12.3 mm Deep base with debris guard to keep mess inside the cage Food and water bowls and perches that accessible from outside the cage Simple, easy, snap-fit assembly No screws, hooks or tools required Accessories: 2 x food & water bowls (blue) 2 x debris guards, 2 x perches (blue) Door that opens from two sides and turns inward.The Bonus eBooks ‘YOUR PERFECT PET GUIDE BY E-COMMERCE EXCELLENCE’ will be sent to you via Amazon message in download form, once your order has been processed.